Sun in Libra – search for the balance between the time that we dedicate ourselves and that we offer to our relationships! Early this morning, September 23, 2018 at 11:55 am the Sun☀️ starts its journey through to the sign of Libra ♎under the young Moon of Pisces♓ that is growing in our sky inviting us to dream big. 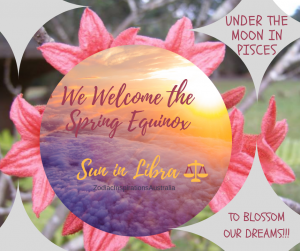 The Sun in Libra marks the Equinox!!! The Universe points us to the importance of working shoulder to shoulder to achieve a common end; be fair in our negotiations; relate equitably; to love our home by making aesthetic touches and to spread the love around us. “I BALANCE”. Level up and harmonize! I take the opportunity to wish a HAPPY BIRTHDAY TO ALL PEOPLE BORN UNDER THE SUN IN LIBRA. Happy Birthday to all the people born with the Sun in Libra including myself!!! Time to celebrate life!!! Tuesday 25th September 2018 at 12:52 pm to empower our emotions. This Full Moon will be accompanied by Chiron at the last day of it in Aries offering a powerful energy to heal a wound! What do I really want for myself? 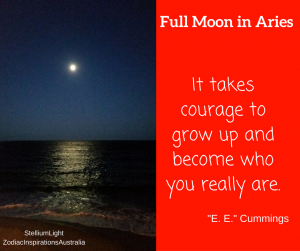 Two weeks ago we planted our goals under the New Moon and now is the time for some of them. Always on a Full Moon we must release energy so that we can blossom our intentions… This time we need to release something related with the sign of Libra where the Sun is … It’s time to ask ourselves – How accommodating am I cutting off my OWN NEEDS to take action putting myself before anything or anyone to achieve what I really want? It is time to balance the Aries-Libra Axis to feel good about ourselves in harmony with people we relate with. ♀️Venus is the planet associated with beauty and love and is the ruler of the sign of Libra. The Moon Calendar 2019 guides you through the energy of each New Moon in 2019 and indicates the times when to take action to work with your intentions to blossom them. Aries New Moon to initiate and begin a new cycle taking action!! Leo Full Moon Eclipse to manifest our joy! The Sun enters Capricorn ☀️♑️ Happy Solstice!!! Make things happen & make our reality, focus to get what we want!! Sagittarius New Moon to take take our adventure heading to 2019 with confidence believing in our talents! Gemini Full Moon to be present and have a good conversation! Scorpio New Moon to heal a wound!